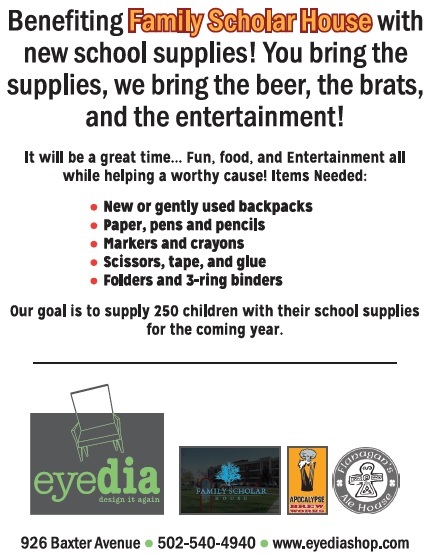 Join Us Tomorrow Sept 10th! Come join us for The Highlands Festival! It’s our first year and we are really excited to be a part of it. All the fun starts at 1pm. Don’t forget to stop by our booth and say hi! Family Scholar House started out in 1995 under the name Project Women.The organization aimed to help women and children in need, then later expanded to help single mothers earn a college degree. 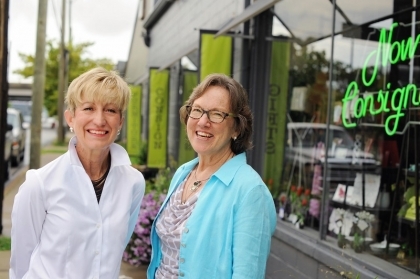 In 2005 the organization came into new leadership under Cathe Dykstra. Three years later in 2008 Project Women transformed into Family Scholar House, and the efforts transformed along with it. According to statistics in 2015, 379 families with a total of 572 children have used the FSH Residential Program. They have also helped its residence earn a total of 241 college degrees. In 20 years of being in operation they have opened three more campuses with a new one under construction to accommodate the growing number of people who thrive from all the amazing work they do there. 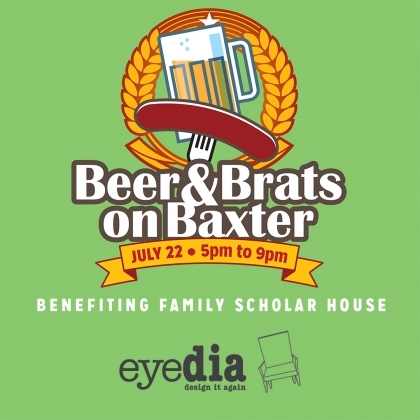 Our annual Beer and Brats Event is a fundraiser for Family Scholar House that was started by Martha Neal Cooke and Diane Stege six years ago. Every year the event grows by leaps and bounds, and of course this year will be no exception. 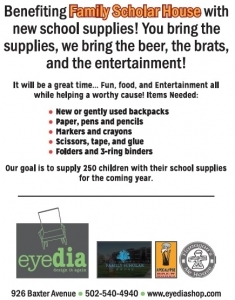 Eyedia hosts this fundraiser to help collect school supplies and donations so everyone is ready for the coming school year. 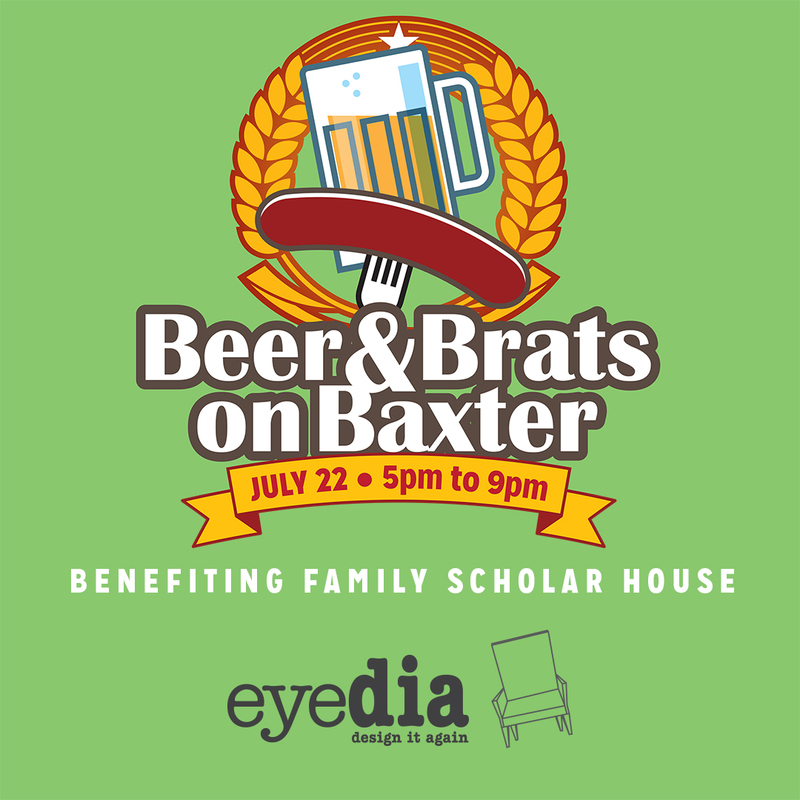 In exchange for your donations we serve brats, beer, hot dogs, salads, chips, and cookies, along with a little music and a fun raffle this year! A percentage of our sales that day is also donated. So come and have some fun, spend some money and feel good about helping a local charity! You can also visit the Amazon Smile page for FSH to find more items to donate. Please Join Us for this FUN local event! We have been hosting this Beer & Brats Event for 6 years and this is our first at the new location. This year we will also have a Split the Pot Raffle & gift certificates to win from local area businesses. Would you or someone you know like to work at eyedia, design it again? We are looking for a part time furniture pickup and delivery person to join our great team. 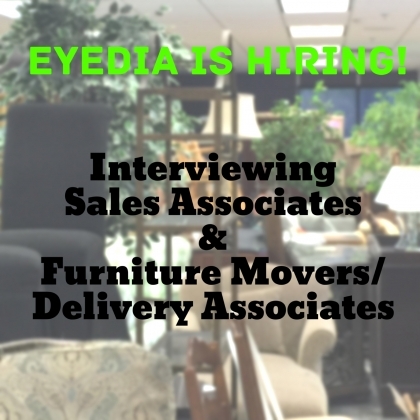 Think you have what it takes to work in the furniture consignment world? We work hard but have lots of fun too!